I adore this image that I found on Funeral For My Fat! 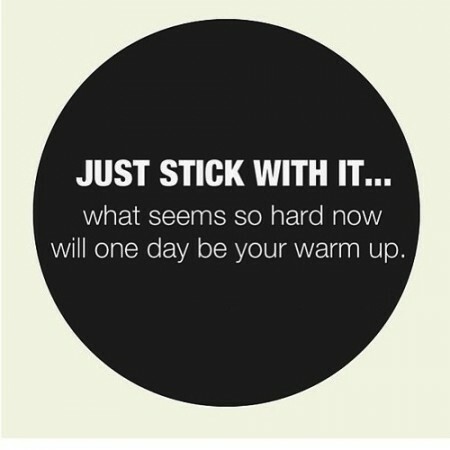 Just stick with it… what seems so hard now will one day be your warm up. I feel like I need to print up a bunch of these on little stickers and give one to myself after each workout. I love this motivational poster that I found on That ARThletic Girl‘s site. Everybody works hard when they feel like it, but only the best do it when they don’t feel like it. I have been following this mantra for a while now. I’ve hurt myself in a bunch of little ways: my foot had plantar facitist, I slightly ripped my hamstring, and a bad pair of shoes gave me blisters on my heels. Despite those injuries, I have found a way around them by walking or riding the exercise bike. In fact, I just looked at my log and I haven’t missed a day exercising for five weeks. Some days I had to take it easy and just walk, but I didn’t just abandon my workouts. I modified them to accommodate my problems. If I can do this, then you can as well. If you’re tempted to skip your workout, remember me, limping along with a torn hamstring. The best workout even when they don’t want to. This motivational image I saw on Funeral For My Fat reminded me that I wanted to talk about exercise. Honestly, if you are trying to exercise to lose weight, it’s kind of a losing battle. Take, for example, the Big Mac. It has 563 calories. In order for me to burn off that many calories, I would have to RUN at 5.0 mph on the treadmill for 48 minutes. I can’t keep up a 5.0 mph pace for that long. It’s impossible for me right now at my level of fitness. I could walk. I would have to walk at 3.0 mph for TWO HOURS AND 25 MINUTES to make up the calories in one Big Mac. Two and a half hours for something that provides me pleasure for less than five minutes (two if I scarf it down). That is such a long time for such a short pleasure burst that the thought of exercising to burn off food is very frustrating. I also like this motivational image from NOURISHED EXISTENCE. 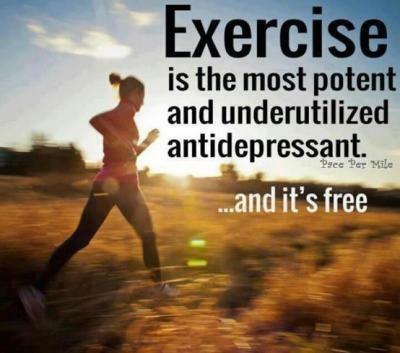 Exercise is the most potent and underutilized antidepressant… and it’s free! 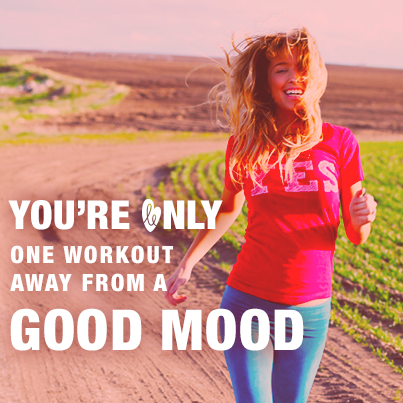 Stop thinking of exercise as a way to “work off” food and start using it for what it’s best for: mood elevation. The happier you are, the less you’ll turn to food for comfort, so get out there and get moving because it will do more for your emotional and mental health than it can do for that Big Mac you ate. I LOVE this image from MotiveWeight! Nothing in this world is handed to you. You have to go out and get it! 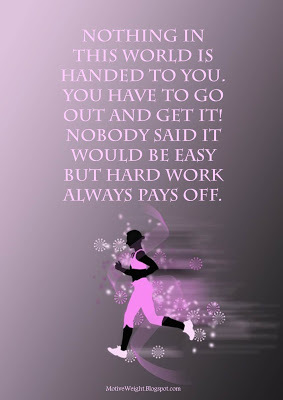 Nobody said it would be easy, but hard work ALWAYS pays off. There have been times when I thought I was working hard or I had been told I was working hard (I’m looking at you, heart rate monitor charts), and I really wasn’t. After long bouts of laziness, just moving at all can feel like hard work. If you think you are working hard and aren’t seeing results, then you need to kick it up a notch. Either you aren’t working hard enough in the gym (or out on the road) or you aren’t working hard enough in the kitchen. REALLY look at your habits and find the places where you can improve. Don’t fool yourself (like I did) into thinking that you are working hard. If you don’t see results, then you have to try harder. It’s as simple as that. I have NO idea what the song means, but it was very helpful to get through a running interval that day. The lyrics were so helpful to me, that I made a motivational poster out of them. The song reminds me to keep moving, to push and to keep going. 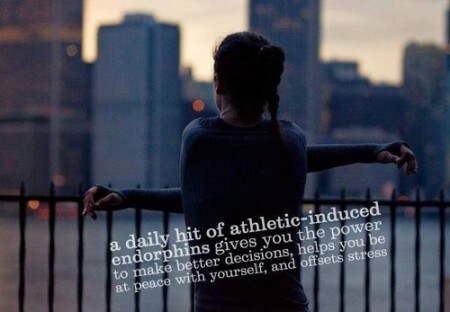 I really need that, especially when I have been running for a while and feel like slowing down to a walk. I love this simple animated GIF I found on work sweat achieve the other day. That pound sign (#) in front of the words, IWill is a hashtag and it’s used to mark things on Twitter and Facebook. In particular, it’s used by Under Armour Sports Clothing to advertise their products. I liked that animated GIF a lot more before I knew it was an advertisement for overpriced exercise clothing, but it’s still inspirational to me. I saw this motivational poster on Fitness, Health, and Confidence, but it wasn’t quite right for me. 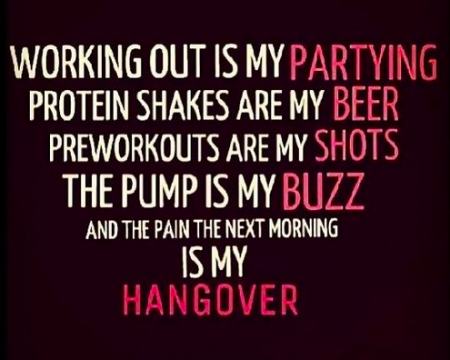 Working out is my partying. Protein shakes are my beer. The pump is my buzz. And the pain the next morning is my hangover. I don’t drink protein shakes and I have no idea what preworkouts or the pump are, so it really didn’t speak to me. 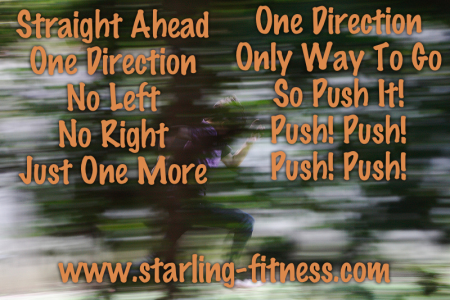 I’m a runner, and running is my partying, so I thought I would make one for me. Muscle pain is my hangover. 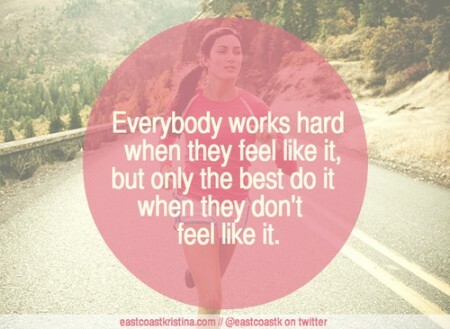 This really means more to me and I need to remember it every time I’m tempted to skip my workout. This motivational poster from MotiveWeight really inspired me. I think I like it so much because the fat girl is pretty and looks happy. 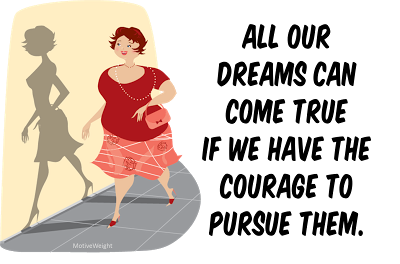 You can be pretty, happy and still want to pursue your dreams, even if your dream is to be thinner. 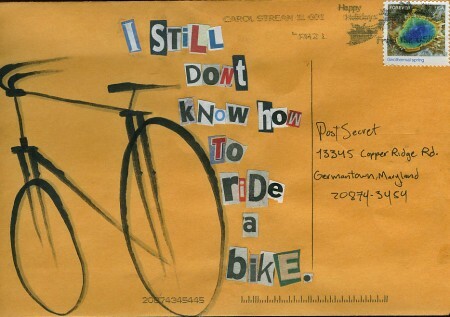 This postcard from PostSecret made me so sad. I still don’t know how to ride a bike. When I was eight years old and first learned how to ride a bike by falling over and over until I didn’t all anymore. 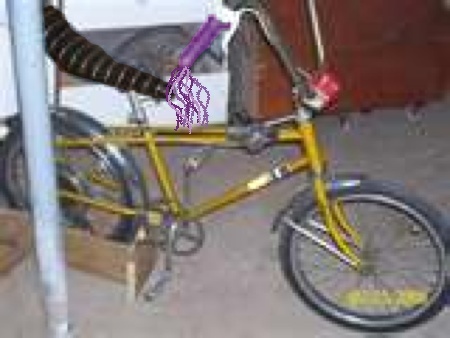 I remember showing my dad and grandpa that I could ride that huge, antique bike from my grandma’s garage and they were so impressed and amazed because I could barely get on the thing and had to stand on the curb just to be tall enough to get on the seat. When I was twelve years old and my mom let Chelly and me ride our bikes to Skateland West all by ourselves. Suddenly a bike represented freedom to me. I felt like I could ride it anywhere. When Mike and I saved up for our first mountain bikes when we lived in Stonehedge. I loved riding it home from Westminster down that huge hill. By the time I got home, the muscles in my legs were throbbing. When I finally got a bike that actually fit me in preparation for an epic bike ride. When my friends flaked on the epic bike ride, I did it all on my own anyway, riding all the way to Lagoon from my house. My heart aches for that person who never learned how to ride a bike. If you are one of those people, then get out there and DO IT! I have had so much joy from riding my bikes over the years and I am wishing all that joy for you as well. The skinned knees and elbows are WORTH it! I ADORE this motivational poster I found on MotiveWeight! Time to photoshop my life. Touch up the edges, adjust the tones, blur out the background, focus on me, and crop people out. 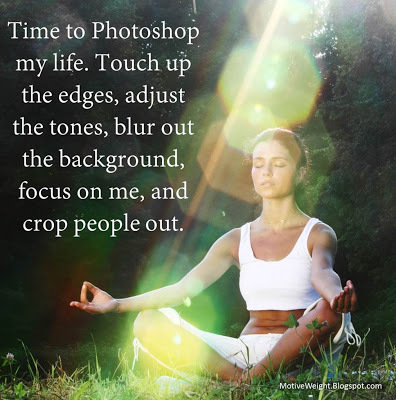 I really wish meditation worked like this for me, especially the “crop people out” concept. My mind is so fleeting that I have never really been able to train it to calm itself when I am meditating. Lately, I’ve tried directed meditation. I’ve written my vision for what I want in my life and each day, in my neatest handwriting, I re-write it. I spend about ten minutes consciously focusing on what I WANT from my life. It’s one of the few times in the day when I don’t think about what I DON’T want in my life. It’s the closest I’ve ever gotten to being able to crop people out of my life, if only because there is no room for them when I’m focusing so intently on what I DO want. Write a page explaining in detail what you want. Make sure you cover all the aspects of your life: health, family, career and emotional well-being. Write a few sentences for each of those things. Make sure they are POSITIVE. Don’t write what you don’t want. Write what you DO want. Each day, spend ten minutes or so re-writing that vision in your neatest handwriting, saying the sentences to yourself as you write them. This technique has worked better for me than trying to quiet my “monkey mind.” I just distract the monkey with shiny toys and concepts. If you have given up on meditation, try my technique and see if it works for you as well.